We are excited to announce that we now offer the latest technology in health care for your pet — Therapeutic Laser Therapy. Our therapy laser provides a deep-penetrating light that is absorbed and scattered, generating warmth within the tissues. As light is absorbed within the cells of the tissues it allows relief of pain by releasing endorphins and it increases the cells metabolism. This new therapy allows relief of pain by releasing endorphins and stimulation cells to heal faster. Your pet will relax and enjoy the pain-free treatments. Laser therapy is effective in treating chronic conditions, acute conditions, and post-surgical pain and inflammation in pets. Whether your pet is rehabilitating from trauma or injury, healing from wounds or simply aging, laser therapy has been shown to provide relief and speed healing. 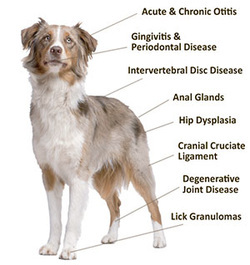 Does your pet have chronic arthritis? This new therapy can be used in conjunction with your pets medications even provide enough relief to help reduce the amount of medications your pet is prescribed for comfort. If you think that your pet would benefit from Laser Therapy call us at (585) 293-2270 to schedule a consultation to find out how Laser Therapy can help your dog or cat. Laser Therapy treatments have a cost range of $20.00 - $50.00 per treatment. Most conditions need 3-5 treatments for significant improvement. We also offer bundle packages on a buy 5 get-one-free promotion. Laser Therapy stimulates the body to heal from within. Non-thermal photons of light are administered to the body and absorbed by the injured cells. The cells are then stimulated and respond with a higher rate of metabolism. This results in relief from pain, increased circulation, reduced inflammation, and acceleration of the healing process. Churchville Veterinary Hospital is excited to offer our clients Companion Laser Therapy! Laser therapy provides a non-invasive, pain-free, drug-free treatment which is used to treat a variety of conditions and can be performed in conjunction with existing treatment protocols. Relief and/or improvement is often noticed with hours depending on the condition and your pet's unique health status. Whether your pet is rehabilitating from trauma or injury, healing from wounds, or simply aging, your companion can benefit from this innovative approach to treating pain. *Call our office today at 585-293-2270 to make an appointment or to obtain additional information on laser therapy for your pet.